I can’t tell you how many times my father has dropped hints that I should draw some golf clothing. He’s a fan of the sport. So, today I am pleased to present some 1920s historical clothing attire for the Marisole Monday & Freind’s paper dolls. The history of women’s sports attire has always fascinated me. By the 1920s, from which today’s paper doll outfit hails, women were participating in many different team and individual sports including basketball, tennis, archery, fencing, and, of course, golf. Golf was pretty popular in the 1920s and women’s 1920s golf clothes were being designed by big names like this golf outfit by Worth. Most women’s golf outfits have skirts, but there were also trousers options, like the ones shown in this article about golf in advertisements. I based today’s outfit off illustrations from my two favorite 1920s fashion history books, Everyday Fashions of the Twenties: As Pictured in Sears and Other Catalogs and 1920s Fashions from B. Altman & Company, both of which are from Dover publications and are excellent resources on 1920s clothing. Sears was a more affordable company while B. Altman was much more fashionable and expensive. Catalogs offer such a great window into what people could purchase in the past. 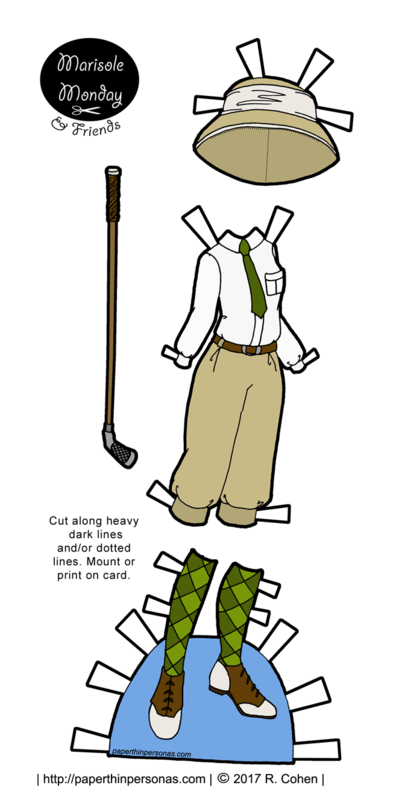 Anyway, I also had to draw a golf club for today’s outfit. Now, I will openly confess that I am not a skillful golfer, but I have taken a lesson or two. I based my golf club (I was not about to draw a whole set) on photos of 1920s golf clubs from Google Image Search. I know, I know. Not the best research practice. when the page was loading, i thought at first she had a pith helmet! love the golf club and, again, the stockings! I love that hat, and had no idea that trousers were acceptable that early in fashion history. Thanks! One thing to remember is that they were acceptable in specific contexts. For example, sports (basketball, skiing or golf), on the beack in the form of lounging pajamas and pajamas themselves. It wasn’t something a women wore out in public to go to tea or something. Love the shoes and socks. The rest is terrific, too!